Finance Minister Paschal Donohoe has blown a potential surplus in Government funds with Budget 2019 just as a hard Brexit threatens to hammer the economy, the country’s top think-tank warns today. The Economic and Social Research Institute (ESRI) warned that a ‘no-deal’ Brexit would hit growth hard, while also cautioning that the Government must take action on overspending. The ESRI forecasts that economic growth next year would be just 2.8pc in the event of a hard Brexit, compared with 4.2pc if Britain had remained a member of the European Union. The odds of a hard Brexit have risen sharply since Monday, when British Prime Minister Theresa May abandoned plans for a vote on the deal she had agreed with the EU. “Even in the short term, Brexit can have quite a big impact,” said Kieran McQuinn, research professor at the ESRI. If anything, Mr McQuinn said, the short term economic forecasts understated the potential impact of Brexit on Ireland. The fallout could be exacerbated by disruptions in financial markets and international supply chains. Over the longer term, a hard Brexit could subtract 3.8pc points off potential economic growth here by 2027, the ESRI said. The report from the think-tank will be a salutary warning today as Mrs May flies in to Dublin in a bid to win concessions that would allow her to sell a deal to hardliners in her government. The ESRI also points out that if there were a large shock to the euro areas as a whole from Brexit, the European Central Bank could delay the start of interest rate rises. These are currently pencilled in for autumn of 2019. This would help ease budget concerns due to the still-high levels of Government debt. But even without the risk of Brexit, the think-tank said the Government needed to take action on overspending and that Mr Donohoe would not balance the budget in 2019, as he promised. “Budget 2019 saw a significant increase in Government expenditure, particularly on capital projects. “As a result, it is now likely that there will be a deficit in the general Government balance in 2019, whereas a surplus had looked a possibility before the Budget,” it warned. 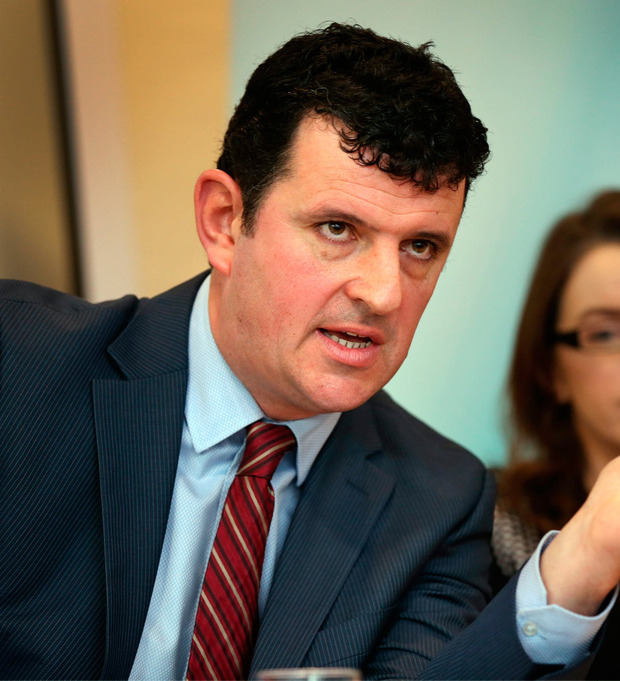 A one-off €700m windfall from corporation taxes has fattened Government coffers this year and Mr Donohoe announced €4.2bn in spending a tax cuts in the Budget. Prof McQuinn warned the Government needed to start accumulating fiscal buffers to cope with economic shocks. “We still think that next year the likelihood is there will be a deficit,” he said. The State’s dependence on a small number of foreign multinationals paying bumper amounts into the treasury has surged in recent years. The worry is that the strong growth seen in company tax revenues could slow, or in the worst case reverse. Two in every five euro of corporation taxes are paid by just 10 firms and these taxes are expected to account for 17.4pc of Government revenue this year, a record level. At the same time, however, the overall tax take as a percentage of gross domestic product is just 22.8pc. In the run-up to the 2008 crash, tax receipts doubled from the beginning of the decade and at their peak hit just over €47bn in mid-2007. Then, as now, corporation tax revenue surged and by 2006 had hit 15pc of Exchequer revenue. Although there are concerns over the stability of these revenues today, the ESRI noted that the recent rise had not been accompanied by the kind of measures that created the 2008 crisis. Back then, company taxes and highly cyclical, transaction-based taxes such as stamp duty were used to finance both a narrowing of the income tax base and a doubling in State spending. The biggest imminent risk from Mr Donohoe’s Budget, Prof McQuinn said, was that it could stoke inflationary pressures in an economy approaching full employment. “The significant increase in expenditure does run the risk of overheating,” he said.